Blackberry and Wild Rose, by Sonia Velton. Blackstone Publishing, May 2019. A delightful historical novel set in eighteenth-century London featuring a silk-maker’s wife who dreams of being artistic and the lady’s maid she “rescues” from prostitution. Sonia Velton is the daughter of British mother and a Sri Lankan father. She grew up in the Bahamas and Great Britain and has continued to live globally. After earning her law degree she specialized in human rights and discrimination law, for a time in Singapore. She married, had three children, and lived in the Middle East for eight years before returning to Kent where she now lives and writes. 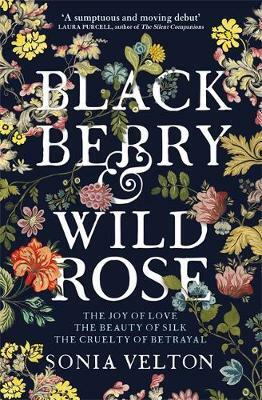 As an historian, Blackberry and Wild Rose is the kind of historical fiction that I appreciate most. Instead of rehashing the lives of famous people, Velton has deeply researched the time and place of her novel and created characters who might actually have lived there. Then she has used her imagination to expand our knowledge of people who seldom had the luxury of writing down what they thought and felt. In doing so she gives us characters with whom we can relate. The story is set in the Spitialfield section of London where Huguenot silk makers wove and sold exquisite textiles. Tension exists there because the silk masters have cut back what their journeymen earn because the sale of silk has declined with the introduction of cheaper calicos. Narration of the story is divided between Esther, a pious, childless British wife of a silk master and Sara, a country girl who had been caught up in a brothel. Esther dreams of designing and creating patterned silk, dreams her insensitive husband mocks. She takes in Sara to save her from a life of prostitution. Velton does a fine job of describing the ever-changing emotions of the two women as they struggle with intimacy, jealousy, anger and genuine affection. Venton excels as a careful observer and a word-smith making her book a joy to read. Her work in human rights law is reflected in her sensitivity to the ways we blind ourselves to the pain we cause others in both the public and private spheres. Interwoven plots move smoothly and hold readers’ attention as we wonder what will happen next. I gladly recommend this book to all who enjoy historical fiction and the interplay of choices which individuals make. ← Under Water, by J.L. Powers.